How can I even begin to explain Rebetika music? 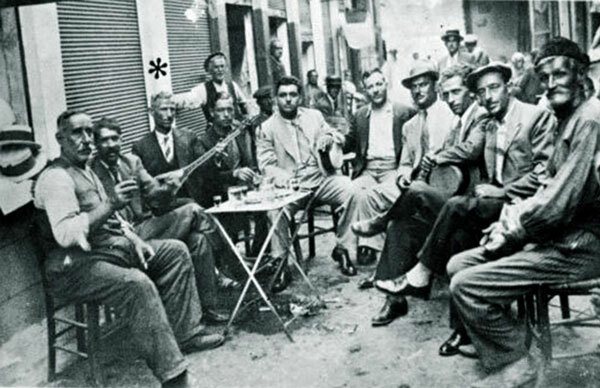 The origins of the genre have been extensively written about (here is a very good historical overview of Rebetika— I don’t know what I enjoyed more: the text, or the fact there’s an Institute of Rebetology in London). The very short version is that it started in the hashish dens in the Greek cities of the Ottoman empire, only to be transplanted to mainland Greece after what most foreign historians refer to as the ‘population exchange of 1923’ and Greeks refer to as ‘The Asia Minor Catastrophe’. It remained the music of the underground, was actively persecuted by the dictatorial regime of the 1930s and only started gaining mainstream popularity in the second half of the 20th century. Rebetika songs are about poverty, oppression, crime, drugs, love, happiness and pain, sometimes all at once, but one things they always seem to have is a core of defiance, both in the robust rhythms, the simple and often riddled with slang to the point of incomprehension lyrics and the frequently gravelly, emotion over refinement vocals. They’ve often been described as the Blues music of Greece, which I can see both from a social origin/ pervasive themes but also in the emotional resonance they hold for me—Blues is the closest I get outside of Rebetika that makes me feel such a mixture of sorrow and joy at the same time. Even in the saddest rebetiko song there is an element of, for lack of a better description, finding enjoyment in suffering. Rather than attempt and miserably fail at giving an overview of Rebetika songs or the most influential figures in the genre, I’m just going to share some of my personal favourites (in several posts, because I’m simply incapable of making a brief list of Rebetika). Where I can, I’ve included a link to an English translation of the lyrics. The quality of said translations is variable, both because it’s free online efforts but because so many of those songs are essentially untranslatable, at least without extensive footnotes explaining the slang, the Turkish words, and the creative use of grammar. It’s impossible to talk about Rebetika music, or Greek music in general, without mentioning Markos Vamvakaris. He is one of the most recognizable figures in Rebetika, and someone most Greek musicians have cited as an influence. This particular song encapsulates for me everything that I love about Vamvakaris’ music and Rebetika in general. The song is simplicity itself, with its straightforward melody, Vamvakaris’ legendary non-vocally skilled delivery (Rebetika voices tend to favour character over technical ability) and the sheer simplicity of the lyrics: as far as love songs go, it lacks any ornamentation, complexity, or traditional romantic imagery, but there is something genuine and downright poetic about that I find a hundred times more effective. I refuse to just pick one song from the immortal Sotiria Bellou—she is widely recognized as the ultimate Rebetissa (the female version of the term Rebetis, a word covering both the music genre and a very specific attitude, background and philosophy). Something not obvious in the translation: she is singing from the perspective of a man to a woman (in the Greek, the ‘kid’ is in the feminine form), something that happened frequently when songs where originally written by men and performed by female singers, resulting in a rather subversive effect. It’s got an added significance in this case, since the fact Bellou was a lesbian was the worst kept secret at a time when it was not something most Greeks even wanted to acknowledge existed. Her musical contemporaries referred to her with the male version of her name of Sotiris, and spoke of her frustration early in the career with the pressure she was under to present as more traditionally feminine while on stage. One of her softer performances, both because of her relative youth at the time of recording (the song came out in 1949) and the subject matter. Despite the lyrics being about heartbreak, there is that tone of dignity, pride and hint of regality that characterized Bellou that keeps it from becoming a typical tearjerker. This is the first song I ever heard her perform, and the one that made me into a lifelong fan. This video is of her actually performing the song in the seventies, and demonstrates that while vocal ability is by no means a prerequisite to sing Rebetiko, Bellou had it in spades. She’s sitting a good foot from the microphone but doesn’t deign to lean forward—she has absolute confidence that the power of her voice will carry through. Technically not the first song by Tsitsanis on this list (he wrote the second Bellou song in the above selection), and undoubtedly not the last. As a songwriter, Tsitsanis wrote more than 500 songs and is considered to be instrumental in shaping the Rebetiko genre. As a performer, he is very much a songwriter singer, though makes it up by his frequently cheeky attitude. This song is anything but cheeky, and his is not my favourite version of it, but I felt the need to include at least one version of him singing one of the most beautifully devastating and iconic songs from his extensive repertoire.